A University of Wyoming professor who is an international leader in the study of the flow of fluid in porous media has been appointed to a prestigious endowed professorship at UW. Mohammad Piri was recently introduced to the UW Board of Trustees as the Wyoming Excellence Chair in Petroleum Engineering, recognizing his global acclaim and impact on the Wyoming economy. Piri heads the Hess Digital Rock Physics Laboratory at UW, which studies interfacial and pore-scale transport in porous media. This work is critical to understanding how fluids, such as natural gas, flow through pores in geologic formations. He also co-directs the Center for the Fundamentals of Subsurface Flow, a multidisciplinary team of UW faculty members who conduct broad research leading to computer simulation of fluid flow in porous media. Piri’s research has resulted in significant collaborations with private industry, which is interested in better understanding characteristics of oil and gas reservoirs, and how to effectively improve recovery using existing recovery processes and technology. 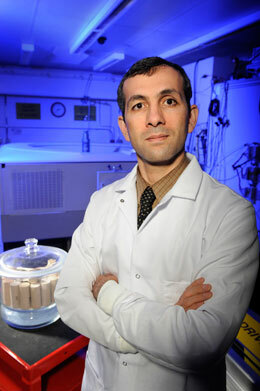 Piri received his Ph.D. in petroleum engineering at England’s Imperial College London and engaged in post-doctoral studies at Princeton University.